Our keynote speaker was Professor Betty Weiler, originally from Canada but now at Southern Cross University, with many years of research experience in nature-based tourism, visitor management, tourist experience and the role of the tour guide. 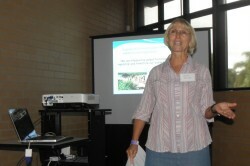 See http://works.bepress.com/betty_weiler/ to learn of Betty’s expertise and publications. She started by demonstrating that we know how to make tours enjoyable, satisfying and memorable, which is good for the tourist and good for business (repeat custom and referrals). She then asked ‘is this enough?’ Can good guiding also enhance sustainability (ecological, social, cultural and economic)? 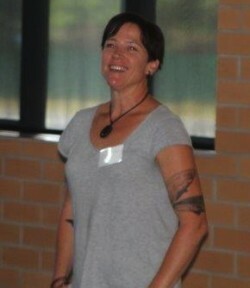 She provided various lines of evidence that good interpretive guiding can and does add to (1) visitors’ understanding and valuing of sites, communities, cultures and environments, (2) influence and monitoring of visitor behaviour during a tour and (3) visitors’ post-visit pro-environmental and pro-conservation attitudes and behaviours. 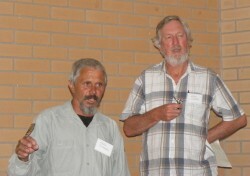 Greg Clancy (pictured here with Mark Flanders: Greg is on the right) spoke of the great diversity of wildlife and habitats in the Clarence Valley, from its source in the mountains to the ocean it flows into, and how this regon is an area of overlap between the southern parts of the range of many northern species, and vice versa. Icons such as kangaroos, koalas, emus, whales (even southern right whales have been seen at Minnee Waters), lyrebirds and brolgas can be found here as well as many lesser known species such as brush-tailed phascogales. He also warned the delegates that no one wold be leaving the room until they understood why the back-necked stork (one of his long-term study species) is really not a jabiru! I then spoke (and went considerably overtime: apologies to other speakers and delegates!) on the economics of wildlife tourism (benefits of wildlife tourism to local communities, and how to get started in the industry). I gave examples of local communities benefiting by wildlife tourism such as Mon Repos, Phillip Island and O’Reilly’s Guesthouse, also some non-financial benefits, and pointed to the great diversity of wildlife and habitats Greg had referred to. I ended with some advice on how to get started in the tourism industry, with some of the characteristics needed by a tour guide and the regulations and permits involved. Mark Flanders spoke on his twenty year experience in ecotourism, interpreting wildlife and landscapes through Indigenous culture. He told us how this region was divided into areas known as koala country, quoll country, stringybark country etc. and mentioned some of the local dreaming stories and the role of totems, but said some of the knowledge of the elders has been lost. He spoke of how the rise and fall of sea levels, changes in courses of rivers, and resultant changes in fauna and flora over thousands of years, has been reflected in Aboriginal stories. W heard about the moonlight muttonbird tours and other tours he’s led, and how these can inspire people, putting a spark of enthusiasm into children, at times even leading to adults leaving the city and live in the bush. One delegate after his talk asked how do we, as tour guides, know what Indigenous stories we’re allowed to talk about. He advised us to discuss this with local Indigenous people, employ them where possible, and nurture long-term relationships.He also mentioned the need for young people to carry on the interpretation of their traditions, but finding the money to employ them was a problem, although demand for Aboriginal interaction was high among visitors. Kirin Apps (of Southern Cross University) spoke of her research on the cage diving with sharks in Port Lincoln, South Australia. She told us of the conservation problems sharks now face, and how despite the negative aspect of local alteration of shark behaviour, this tourism experience provides an alternative activity to shark fishing and a platform for public education. There seems to be considerable potential for increasing the educational value, as the visitors from some operations responded to surveys that the would like more information on the sharks. One of the more surprising notes was that people often expressed nervousness about being underwater and breathing through a regulator if this was a new experience for them, but actually relaxed when the shark approached, their emotion switching to awe of the mighty creature now in front of them. Almost all of the respondents, about half of whom were international, had visited Port Lincoln primarily for this experience, and over half named it as the reason for visiting South Australia. I then spoke on minimising negative impacts and maximising positive ones, pointing out the importance of monitoring before and during tourism operations, and that by widely-accepted definitions of ecotourism, anything that has a significantly negative impact on wildlife (both our target species and all the others that contribute to a region’s biodiversity) is, by definition, NOT ecotourism. I considered some of the major impacts and ways of avoiding them, and stressed the importance of realizing the complexities of ecosystems and species interactions, and then gave examples of tourism ventures (including a number of Wildlife Tourism Australia members) that are doing something positive for wildlife conservation. Delegates showed considerable interest in the idea of promoting and developing wildlife tourism in the Clarence Valley, and the possibility of starting a local chapter of Wildlife Tourism Australia to continue conversations, create a supportive network and plan for the future. Greg led a local half-day bird-wacthing tour the following day, during which 94 species were sighted (including a few mammals, reptiles and amphibians).